This page is about the heavy tank IS-2. For the later versions, see IS-2 (1944) and IS-2 "Revenge". The IS-2 is a Rank IV Soviet heavy tank with a battle rating of 5.7 (AB/RB/SB). It was introduced in during the Closed Beta Test for Ground Forces before Update 1.41. The IS-2 introduces the heavy-hitting 122 mm D-25 gun as a tank armament, presenting massive firepower with a devastating post-damage effect. It's effect on the battlefield should not be underestimated. Operational and visual characteristics of the IS-2, as its design and name suggests, is visually similar to its previous sister-tank, the IS-1 but with operational characteristics of a Tank Destroyer in its Rank and Battle-Rating. Players experienced in operating previous models of the KV series tanks in particular the KV-2 and SU-line of Tank Destroyers should have little to no difficulty in adjusting to this vehicle. The IS-2 has sufficient armour, but will not protect from the guns of its rank. The frontal plate has 120 mm of armour plating, which will not stop anything the IS-2 faces, making slight angle adjustments a paramount survivability essential. However, due to a tendency for the driver's view port to literally absorb the round, most players will not aim here. The LFP has a value of 100 mm angled at 27 degrees, and will not bounce any shots. 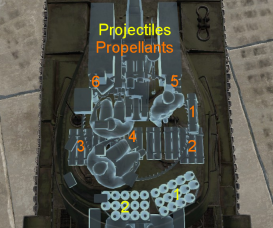 Since behind the LFP is the driver and the 2 main fuel tanks, a penetrating round will have catastrophic results for the IS-2. The side armour is 90 mm, and observing the front of the tank, it has a noticeable curvature to it. When viewed from the front, the 90 mm of armour will deflect or absorb a high number of shots contrary to the 120 mm plate. Angling with large adjustments will cause the IS-2 to render this part useless and make the tank extremely vulnerable. The frontal turret armour is 100 mm with a distinctive "cheek" construction. As with any "cheek" construction, the lower part may act as a shot trap and the middle may absorb shots, but it is more than likely to fail against high-penetration guns. Ammo racks of the IS-2. As the tank's design purpose suggests, the IS-2 is a heavy tank built with an emphasis of engaging hostile armoured vehicles as well as a break-through tank. The tanks heavy armour retains the similar properties of its IS-1 and previous KV line of battle-tanks but introduces some sloped armour on the front plate and turret mantlet. Differing from its IS-1 predecessor, the IS-2 comes equipped with the large 122mm D-25T gun and a slightly more armoured but elongated turret. Although powerful, the D-25T main cannon of the IS-2 is encumbered by a slow reload time, mimicking that of the Soviet Tank-Destroyer line of vehicles at around the mid-20 seconds. Nevertheless, this vehicle with its powerful cannon and shell will commonly destroy almost all but the most heavily armoured vehicles with a single shot, behaving similarly to the older KV-2 predecessor, albeit with half the time required for reloading. In the tank's Battle-Rating and Rank, the armour of the IS-2 no longer stands up to much punishment with the advent of opponents with more powerful weaponry, and caution should be taken. Close-quarters combat and brawling against more than one target at a time is highly discouraged due to the long reload speed unless the tank operator is trapped and situation requires this as an absolute necessity. Alternatively, if escorted and accompanied by other friendly tanks, the IS-2 can be supplemented and perform better in dire close-quarters situations. 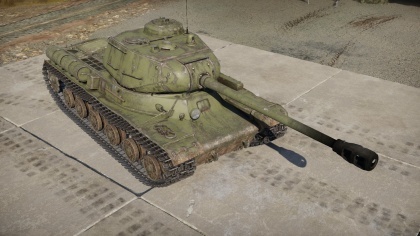 Although classified as a heavy tank and an upgraded improved design over the KV predecessor, the IS-2's armour will no longer hold up to its more common and heavier opponents of its Battle-Rating and Rank. Compared with other vehicles such as the new German Tiger II, American heavy T-series tanks; most of which can easily deflect even the most powerful shots of the IS-2 unless targeted specifically and known weak-spots. Because of this, it is recommended to always travel and fight in groups of two or more vehicles. The slow and difficulty in maneuvering of the vehicle (especially in confined spaces) will more than once place the IS-2 in significant danger. It is recommended to field the IS-2 into a fire-support role, peeking over the shoulder of friendly, more heavier vehicles and firing a shot against the opposition in tandem. Another significant note of this vehicle is the IS-2's considerably fast reverse rate, the highest of its Rank and Battle-Rating for the nation's faction inherited from its IS-1 predecessor, topping at 17 km/h. During situations where an engagement is expected, an unorthodox strategy can be utilized where the operator of the IS-2 tank re-positions the vehicle 90 degrees and drive in reverse with the rear facing towards the enemy. By driving in reverse this way, the engine blocks make a crude yet somewhat effective shield to protect the more delicate crew members. As the fuel tanks are mostly stored at the front on the left and right side of the driver's station, the risk of fire and fuel-tank explosion is reduced significantly (but not completely eliminated) and thus, the tank is able to resist even the most powerful of shots. Be aware that more experienced players may attempt to instead fire at the more exposed turret of the IS tank and instantly knocking out the crew with a common APHE penetrating shell in this way. German Tiger IIs, Panthers will be common encounters at the IS-2's Battle-Rating and Rank, combined with the more threatening and heavier American T-Series tanks such as the T34 and M26. At this Battle Rating and Rank, more powerful British Tanks such as the Centurions will be encountered. As previously specified above, The IS-2 no longer retains its armour advantage in this Battle-Rating and Rank un-likes its IS-1 predecessor and thus, it is important to identify and fire on targets first before they do. In this rank, Tanks such as the Panthers, Tiger II and similar vehicles will be present with sloped armour, strong enough to even withstand the might of the 122mm Shells of the D-25T gun. A common design flaw however, is the turret of said vehicles, commonly being mostly blunt and flat and easy to penetrate. A patient and well placed aim and shot against these surfaces will destroy the target with no more than a single shot. Be aware that most opposition vehicles at this rank have lower caliber and puncturing power than the D-25T of the IS-2, but come with an improved reload speed, a reload speed commonly faster than the IS-2. Japanese line of tanks at the same rank of the IS-2 are of little concern; their poor armour and armaments at the same rank will render them relatively easy to destroy. Another specific enemy vehicle worth noting is the German Ferdinand Tank Destroyer. Most new players in Rank IV battles fielding the IS-2 may commonly mistaken the front armour of the Ferdinand as appearing as thin as similar-looking tank destroyers such the Nashorn and are commonly caught unaware that almost the entire front of the Ferdinand consists entirely of heavy 100mm and 200mm plate armour, the largest being the fighting compartment located behind the driving compartment. 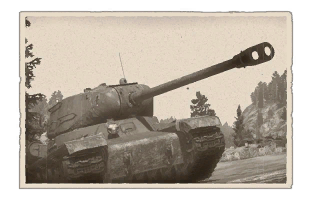 Due to it being such a large target, many players including both IS-2 users and other vehicle type users alike will be tempted into firing at that portion expecting easy wins, only for almost all shots to be absorbed, even the powerful shells of the D-25T. It is recommended to avoid engaging the Ferdinand or ignore it entirely. If opportunity arises, the Ferdinand's weaker side and rear armour should be targeted (80mm). Excellent firepower with nearly unmatched one-shot potential. Repositioning of fuel tanks reduces chances of fires. Players proficient with the KV-2 and Soviet Heavy Tank Destroyers will feel comfortable with the IS-2. Extremely poor gun depression (as most Russian tankers will be accustomed to). Very low rate of fire. Sub-par armour for a heavy tank, inherited from the IS-1. Poor maneuverability, very bad hull traverse speed, often needing forward acceleration before turning. Effort began on another heavy tank after the IS-1's 85 mm gun no longer had a firepower advantage after the standard T-34 medium tank was upgraded with the same gun into the T-34-85. Due to that, the IS-1 was discontinued in January 1944 with about 107 units produced. Those in storage still awaited upgrade to become a more powerful heavy tank. In late 1943, the upgrade of the IS tank began and the choices available were rounded down to two weapons, the 122 mm A-19 gun and the 100 mm D-10 gun. Both guns had their advantages and disadvantages in their specifications, the 100 mm D-10 had a much better armour penetration capabilities and uses a single-piece ammunition, the 122 mm A-19 has a better high-explosive round and used a two-piece ammunition In the end, the 122 mm A-19 (adopted as the D-25T) gun was chosen as the gun of the new IS tank due to larger supply of the gun available for use (the D-10 was a newly produced gun) and the better high-explosive round available. The better high-explosive round is due to the heavy tank's specification as a "breakthrough" tank than a anti-tank role, so it was meant to fight fortifications more than against armour. Nevertheless, against armour, the 122 mm gun proved a very lethal cannon against armour, having the capacity to knock out any German tanks fielded in the war, even the Tiger II, though the ease of knocking them out vary from their armour protection. The 122 mm gun's two-piece ammunition was perhaps the gun's worst drawback, this along with the heavy shells and charges that it uses causes reloading speed to only be one and a half rounds per minute maximum. Even after some modernization to the gun including a semi-automatic breech, the firing rate only increased to two to three rounds per minute. Another drawback of the gun was the size of the ammunition that the 122 mm gun uses, the IS tank interior could only hold 28 of such ammunition, which restricts the time the IS could last in battle before requiring a resupply. In battle, the usual distribution of the shells is 20 high-explosive and 8 armour-piercing rounds. The finished IS tank with the 122 mm gun, first called the IS-122, was finally approved and renamed the IS-2 heavy tank, some were rearmed IS-1s from the factory with the 122 mm gun. The IS-2 tank, like the IS-1, was superior to the previous KV-1 tanks used in the Red Army. Production of the IS-2 started in October or November 1943 and by the end of World War II when production ended, a total of 3,854 units were produced. 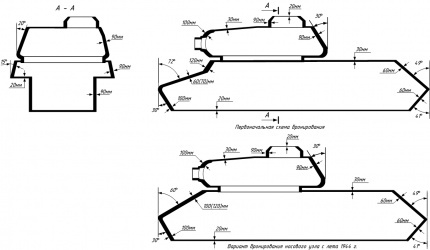 The IS-2 tank hull was similar to the IS-1 tank, but the turret was modified to accommodate the larger 122 mm D-25T gun. The suspension was a torsion-bar suspension system and the tank was powered by a diesel V2-IC engine. The drivetrain and the engine were taken from the KV-1 tank, yet was considerably more mobile. The armour on the IS-2 was a 120 mm thick front plate sloped at 60 degrees with a small step in the front for the driver's hatch. This "early version", developed from the KV-13 design, was produced from the initial production lines until some time in late 1944, where a IS-2 mod. 1944 version was modified with the front plate now a single sloped 120 mm plate at 60 degrees with no interruptions in order to eliminate shot traps and weaknesses in the armour design. Other design changes when the IS-2 was upgraded to the 1944 model was a stronger gun mount, wider mantlet, and an addition of a Dshk machine gun on the turret. The formidable armour of the IS-2 is able to withstand the 88 mm shells from the Tiger I at 1,000 meters out, yet the whole tank weighs less than the Panther at only 46 tons. Despite its construction, the IS-2 was still quite crude in quality and can have signs of being hastily built from the factories. This did not affect its battlefield performance greatly and the crude construction is merely a side effect of the fast production of the tanks to fill battlefield demands. The IS-2 first saw action in early 1944. The IS-2 was organized in heavy tank regiments, each with 21 tanks. Their role was to spearhead the offensives launched at each sector, breaking through enemy emplacements and supporting the infantry by destroying enemy fortifications, they were not meant to exploit breakthroughs and this role was given to the lighter T-34 tanks. Their first reported action was in April 1944 in the 11th Special Guards Heavy Tank Regiment near Tarnopol, Ukraine. The IS-2 presented such a surprise to the Germans as no Soviet tanks before could engage with accurate fire from more than 3 kilometers away. A bigger shock was when they found out the 88 mm of the Tiger I couldn't adequately penetrate their armour. The IS-2 initial combat experience was limited due to the inexperienced crew and organization, but more and more IS-2 started to come in to reinforce the Soviet forces. After World War II, the IS-2 production was replaced by the more heavily armoured IS-3, but the IS-2 stayed in service up until 1982 due to modernization efforts on the IS-2. These modernized IS-2 were named the IS-2M and were done in the mid-1950s. These modernization efforts added external fuel tanks and stowage bins onto the hull, and protective skirts on the edges of the tracks. The IS-2 were finally placed into storage in 1990s and were kept in reserves or sold out as scrap metal. Like most of Soviet Union's military hardware, the IS-2 was given out to the Warsaw Pact nations as supplies. The IS-2 was thus lent out to Poland, Czechoslovakia, Hungary, China, North Vietnam, and maybe North Korea. Later in 1960, a shipment of IS-2 was also sent to Cuba, these were converted into bunkers and coastal defenses as spare parts for the tank never made it to Cuba due to the US blockade imposed in 1962. Skins and camouflages for the IS-2 from live.warthunder.com. This page was last edited on 17 March 2019, at 16:34.